Peter Barber, the head of Map Collections at the British Library, discusses his desire to demonstrate that maps are less about showing where we're going and more about revealing who we are. "I wanted to demonstrate," he says, "that maps are ultimately and primarily about man and the societies in which he or she lives." Levenger Press: How did you decide which maps to include in The Map Book? 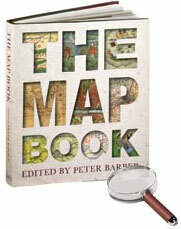 Peter Barber: I set out to present as wide a range of mapping as possible, both over time (from 1500 B.C. to last March) and culturally (with examples of native mapping from India, China, Mexico, Burma and Turkey, and a Jewish map of the Holy Land in Hebrew, as well as from Europe) and to show the enormous variety of roles that maps have played over time in the societies in which they have been created. So as well as small practical maps, such as cycling and road maps, I've included grand maps intended for display, confidential maps meant for government, games, furniture and maps in what may seem to be strange formats. LP: How did you compile such a broad selection? PB: Luckily I was able to gather together a group of about 60 scholars, all of them specializing in different aspects of mapping (though coming from a variety of disciplines) who thought similarly. In addition, they also believe that research findings are of little use unless they reach the mainstream. I gave them some guidance as to what sort of map I hoped they would write about, and asked them to avoid jargon, but left the specific choice of map to them. Many chose to write about more than one map. The result is a book containing many maps that have never, ever been reproduced before, accompanied by short texts that often contain fascinating and little-known stories. LP: What was your overarching goal? "There is no such thing as linear progress towards perfection in mapping." contrary to what you make think, the earliest map to name America and show the New World as a separate continent, dating from 1507, was a great jump of the imagination and not at all based upon hard, discovered evidence. These are all excellent maps in that they meet their specified purposes extremely well. And at a spiritual level, they are far more significant than the mathematically precise map that points out the location of your nearest supermarket. Of course, this is not to deny that geography and measurement have frequently played a very important role in mapmaking. The book contains one of the first maps on the Mercator Projection as well as a mid-twentieth century development from it created to accommodate the needs of air travel. The book also contains the earliest European maps to depict "discoveries" like sub-Sarahan Africa in the Fra Mauro map of 1450, and the first map to show any part of America, the Juan de la Cosa map of 1500. LP: As instruments of measurement, how objective are maps? PB: However scientific a map is, ultimately it has to be subjective. Given the impossibility of accurately depicting the round globe on a flat surface, and the impossibility of putting all of the chaotic minutiae of reality onto a map, man has to make choices - and choice and thus bias, taste and the emotions enter in. This is as true in the super-scientific present, where decisions have to be taken about the data and colors to be used in Geographical Information Systems, as it is in the rock art of the distant past. LP: Viewed collectively, what message do these maps convey about how societies see their world? PB: The maps convey as many messages as there were societies. Most mapmakers share the assumptions of their age. But because of their concise, graphic form, these mapped images often convey their information more forcibly than the written word. If you really want to understand the combination of traditional piety and English patriotism of Henry V's England, take a look at the Evesham world map of 1415. If you want to get under the skins of the early American colonists, look at William Hubbard's 1677 map of New England. "The earliest map to name America and show the New World as a separate continent was a great jump of the imagination and not at all based upon hard, discovered evidence." LP: What are the most curious maps you've reproduced? PB: There are plenty to choose from, including coins, playing cards, escape maps made to be inserted into the boards of World War II board games, frescoes, a mosaic, tapestries, a map made out of toxic materials for bombing crews, the largest book ever created (and one of the smallest), a piece of furniture, a poster, a map on marble and another which may have begun life as the decoration on a ceremonial Roman shield. Then again there are some absolutely awful maps - like the map, masquerading as modern and up-to-date, that was over 70 years old when it was printed in 1785. You may think it curious that such a map was included - but it is part and parcel of the real story of mapmaking. "However scientific a map is, ultimately it has to be subjective." LP: What's your favorite map in the book? PB: The answer depends on my mood! I'm very keen on Blome's map of the Holy Roman Empire of 1669 because it speaks to me directly: it is English, as I am by upbringing, but it shows the lands in Bohemia, Moravia and Austria from which my family originates, and Switzerland, where my wife comes from. It is quite handsome, at least in my eyes, is dedicated to Prince Rupert of the Rhine, one of my childhood heroes, and, as readers will find out, the map itself has a very human tale to tell. LP: Who were history's best mapmakers? PB: An obvious candidate would be the great sixteenth-century mapmaker Gerhardt Kraemer, or as he is better known, Gerardus Mercator. A man of deep integrity and an outstanding intellect, he was also a superb mathematician, a leading draughtsman and penman, and a keen and inquisitive geographer who was very discriminating and critical in his use of his sources. LP: If someone were interested in collecting maps, what advice would you have? "If you want to get under the skins of the early American colonists, look at William Hubbard's 1677 map of New England." PB: First and foremost, only become a collector if you are genuinely enthusiastic about maps! Once you begin collecting, you should follow your own instincts and interests. Do not regard it as an investment (though sometimes it may eventually prove to be so because what interests you may well interest others). Pick a theme or themes and read up about them so that you may eventually, if you feel so inclined, make your own particular contribution. While some themes will prove to be expensive, there are still numerous areas of mapping - particularly those dating from after 1850 - where prices are still relatively low, and yet the themes are as fascinating as any of the classical areas such as historical world maps. Enjoy the maps and forget about how much you paid for them - insofar as your partner, spouse or bank manager allows you to do so! See some maps from The Map Book on our Excerpts page.